To celebrate National Banana Bread Day, I adapted the recipe from My Kitchen Snippets partly because I still have leftover of bananas and dried cranberries. 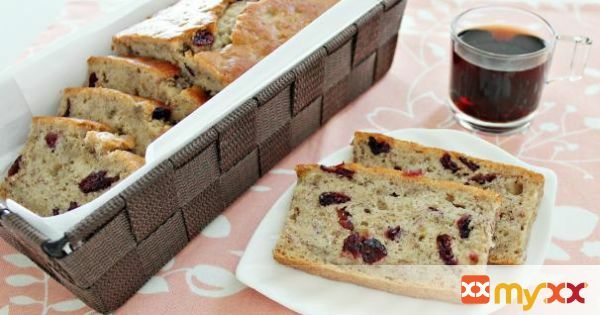 This is the moist, soft and delicious banana bread recipe that I ever tasted. It is so fragrant while it's being baking in the oven, I'm giving 5 stars for it. You don't need an electric mixer for this, just mix the ingredients with a large spatula and push the loaf pan into the oven and you're done. My only problem is the baking time took up to 70 minutes for the bread to be fully cooked. Why? Because I've put in too much bananas and I threw in all the grated apple juices while mixing that made the batter quite wet. So remember to check on the timing when you want to bake this banana bread as temperature varies. 1. Line and greased a loaft pan. (I used cooking spray to grease the pan) Pre-heat the oven to 350 degree F (170 C). 2. In a mixing bowl, combined flour, baking powder, baking soda, salt and sugar. 3. Mix well and set it aside. 4. In another mixing bowl, combined eggs, milk, oil, vanilla, grated apple and mashed bananas. 5. Mix it well with a big spoon. 6. Add in the dry ingredients into the eggs mixture. 8. Lastly add in dried cranberries. 9. Mix well and pour it into the baking pan. 10. Bake for 70 minutes or skewer inserted into bread and comes out clean.